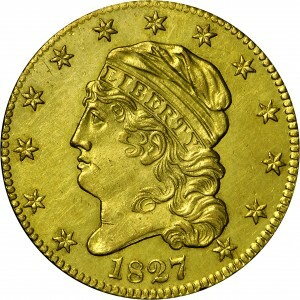 Just this one variety of 1827 exists from a mintage of 24,913 coins. 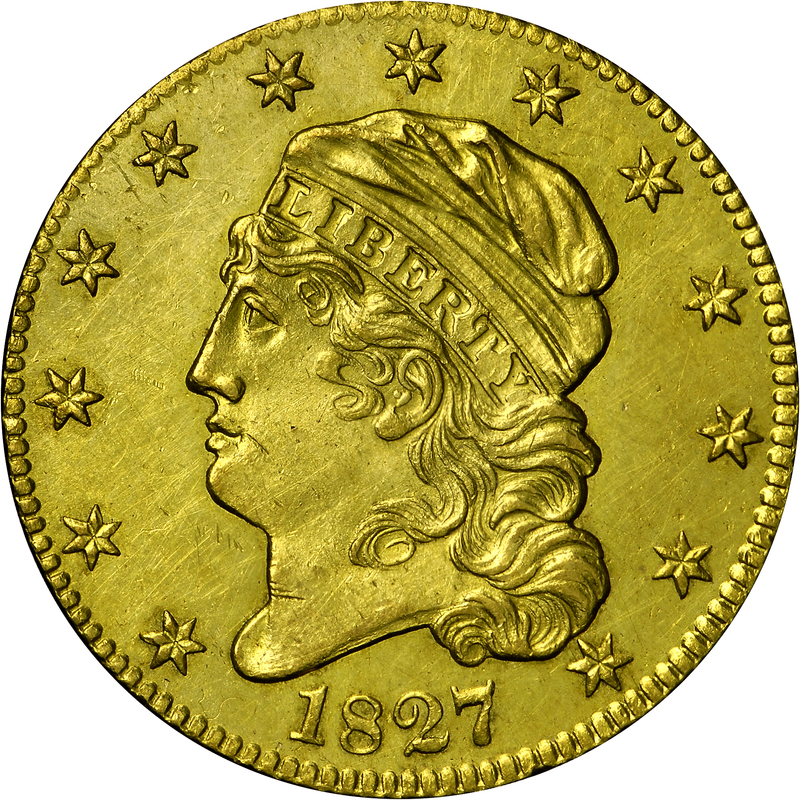 Possibly 15 examples survive from this mintage with most in nearly Mint-State. Harry Bass acquired this example from the impressive Eliasberg Collection. 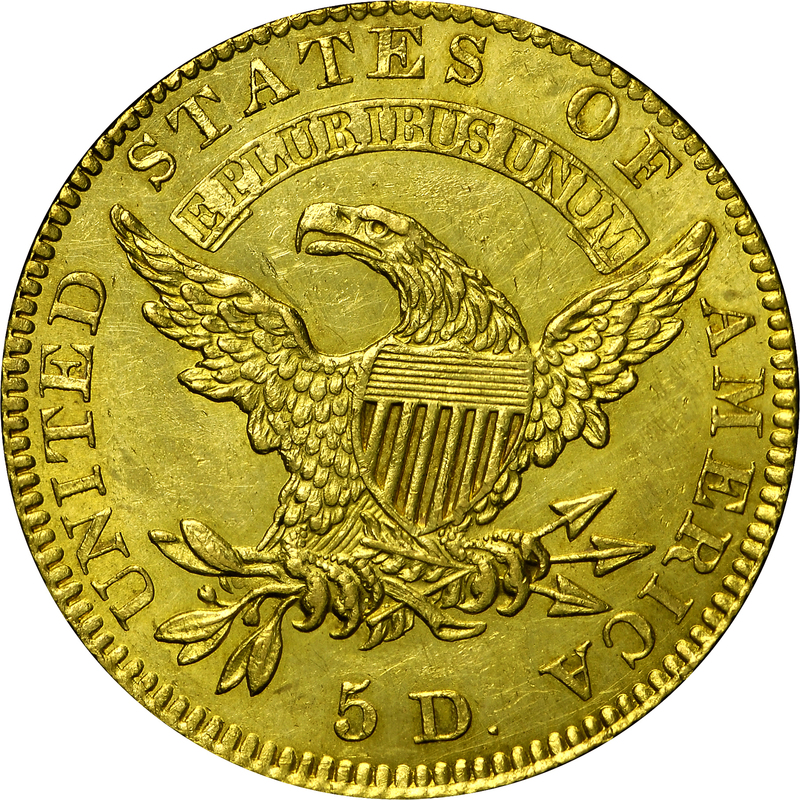 The pedigree of this lovely coin extends back to Harlan P. Smith and was sold by the Chapman Brothers in 1906, whence to John H. Clapp, Louis E. Eliasberg, Sr., and Harry Bass. Walter Breen specifically cited this example as one of two known Proofs, the other being in the Smithsonian Institution. The cataloguer of the Eliasberg Collection felt this was not a Proof. From the Bowers and Ruddy Galleries sale of the Louis Eliasberg Collection, October 1982, Lot 384. Earlier from the Chapman Brothers sale of the Harlan P. Smith Collection, May 1906. "Obverse: Close date. Belted 8. Top of 1 just a bit higher than that of 8. 7 centered under curl. Reverse: That of 1826A. Small letters. Perfect T (no triangular punch in bottom of upright). S over E. T over R and space right. S over U and space right. Base of E minutely high to that of adjacent T. Perfect M. Fairly wide 5 D, 5 distant from leaf, top of 5 markedly higher than that of D. Very small irregular oblate period. Shallow rust between stems. Lapped."